After a very brief illness terminating in congestion of the brain, Oliver Smith Kelly, Springfield’s pioneer manufacturer, died in the city which had been his home for most of his 79 years of life, on Monday, April 11th. Mr. Kelly was born on a farm near Springfield, 0., of Scotch-Irish parentage, and with the exception of four years spent in California during his early manhood, has lived in his native county. Brought up a farmer, at the age of eighteen he decided to learn a trade, and apprenticed himself to John and Joseph McIntyre, pioneers in the carpenter trade in the county, serving for three years and receiving altogether in that time, besides his board, just $168 in wages. He then started out as a journeyman carpenter, working first for James Leffel, the inventor of the turbine water wheel. About a year after this he entered into partnership with J. A. Anderson and the two carried on a carpentry and building business for six years. But this did not satisfy him and, hearing wonderful accounts of the wealth to be secured in California, he determined upon a bold step. In 1847 he was married, but so great was his desire to seek fortune in the far West, that, leaving his wife and infant child, he started for California in March, 1852. The journey was accomplished with the usual hardship common in those days and, arrived in California, Mr. Kelly spent the first three months in mining, with indifferent success. He soon saw an opportunity for the exercise of his trade, and taking advantage of the demand for skilled carpenters went to Marysville, where he entered the employ of Daniel Sifford, with whom he formed a partnership and eventually purchased the entire business. He remained in California for nearly four years, during which time his business as a contractor had grown to such proportions that when he grew anxious to return to his wife in Ohio, he was able to realize a comfortable sum and to bring home with him the nucleus of the splendid fortune which he in later years amassed. He came back to Springfield in February, 1856. With the capital at his command he entered the wholesale grocery business. But he did not find it tasteful to him, his training and pursuits having been of an entirely different nature, and he soon seized an opportunity to dispose of his interest. It was therefore not until 1957 that Mr. Kelly entered the line of business, which he followed to the day of his death—that of manufacturing. In the fall of that year he formed a partnership with two struggling young men who were making slow headway in the manufacture of reapers, and the new firm was called Whitely, Fassler & Kelly. The comfortable sum which Mr. Kelly was able to bring into the firm, as well as his mechanical genius and business ability, made him a valuable addition to the firm. They started in a small shop on the present site of the Kelly building, and later the shops were located where the Arcade now stands. The first year the new firm turned out 127 machines, but there were difficulties to be overcome and the machines were not complete or possessed of the improvements which were to make them so great a success in after years. It took several years to firmly establish the new company, but it grew steadily until in 1867 the output of machines for the year reached 2,700. At this time the business had assumed such proportions and had become of such wide interests that it was thought best to divide the firm into three companies. This was done, and they were the Warder, Mitchell & Company, the Champion Machine Company, and the Whiteley, Fassler & Kelly Company, the first two companies paying royalties to the last named. In 1881 Mr. Kelly sold his interest in the company to W. N. Whiteley. The old shop site was abandoned, Mr. Kelly receiving it in part pay for his interest. He soon after tore the old shops down and built the famous Arcade, which for years has been one of the notable sights of Springfield, and in nearly all the time its leading hotel. The Arcade was erected at a cost of nearly $300,000, and in its erection Mr. Kelly had as much in mind the good of the city and a desire to add to its interests as his own personal advantage. He could not long remain away from active business pursuits, and in October, 1882, bought the Rineheart, Ballard & Company threshing machine works in this city. 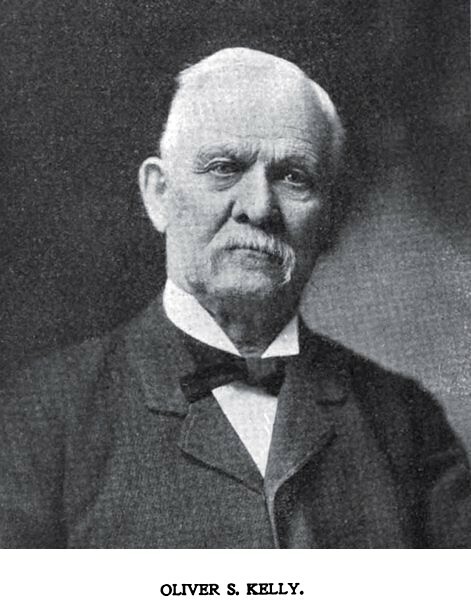 A stock company under the name of the Springfield Engine & Thresher Company was formed, of which he was elected president, with O. W. Kelly superintendent. It soon became necessary to double the size of the plant, and additional work was taken up by the firm. Within three years the business doubled, and through New York agents much of the products was shipped to all quarters of the globe. Later the company name was changed to the O. S. Kelly Company, by which it is known to the present time. The manufacture of threshing machines and engines was later largely transferred to Iowa City, Ia., where about four years ago extensive works were established. For the last five years the company has manufactured piano plates extensively and road rollers have long been a staple product of the company, the Kelly road roller being known and used the world over. Mr. Kelly was married December 23, 1847, to Ruth Ann Peck. He leaves two sons, O. W. and E. S. Kelly, of Springfield, both prominent in business and social circles. It is nearly three years since Mrs. Kelly died. She passed away May 9, 1901, since which time Mr. Kelly has made his home at the Arcade Hotel. Mrs. Kelly’s death was a severe blow to him, for the two had been very close to one another, and she had in every sense been his companion. It is thought that his decline may have started with his wife’s death for it was a great grief to him. Mr. Kelly was not only a pioneer manufacturer, and a man who has played a prominent part in making industrial Springfield, but as a model citizen, and one who has taken a prominent part in the administration of the city and was ever alert to make for the city’s good. He was proud of the Springfield he had helped to make and he lost no opportunity to testify to the personal interest he felt in her welfare. One of the most substantial evidences of his pride was his gift to the city in 1889 of the fountain that stands in the Esplanade, fronting the city building, in which he also felt a personal interest.